As we enter the New Year, this is a perfect time to start thinking about new window blinds and shades to give your home or office a fresh look. What will be the top 2015 trends in window coverings? What will be the most popular window blinds and shades in the Houston area? Find out what we’re seeing at Houston Blinds For Less. People love the simple luxuries technology provides, and motorized window blinds and shades are no exception. Motorized blinds and shades not only offer the ideal window covering solution for those hard to reach windows, but also blend well with other home automation features for energy savings and modern conveniences. Easily controlled with a wireless remote, you can raise and lower multiple remote window coverings with the touch of a button. Or, automate your window blinds and shades with a programmable timer or sensor, an excellent option for controlling your window coverings to save energy. Setting your blinds and shades to open or close while you are away also makes it appear as if someone is home. 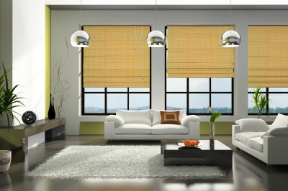 Offering convenience, safety and style, motorized blinds and shades will continue to grow in popularity in 2015. 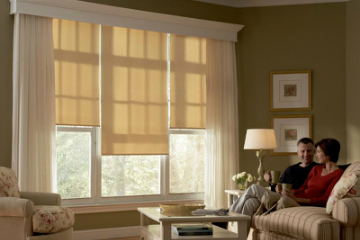 Natural woven shades and blinds bring the simplicity of the outdoors inside to create a fresh, relaxing environment. A popular window covering for 2015, woven wood shades and blinds made with organic grasses, bamboo and other natural materials offer an inexpensive way to cover your windows and give your space warmth. Another Eco-friendly window covering is the honeycomb cell shades. Also called accordion shades, cell shades are the most energy efficient window shades due to their honeycomb-like design with pockets of air. In addition to energy savings in both summer and winter, honeycomb cell shades also provide noise reduction and give homes and offices the clean, modern style popular in the New Year. Giving any room a look of classic luxury, roman shades will remain a popular window covering in 2015. With a wide variety of colors and fabrics, you can select the right roman shades to reflect your personal style. Individuality, simplicity, creativity and green living are among popular home décor trends for 2015. Be creative with your decorating in the New Year. 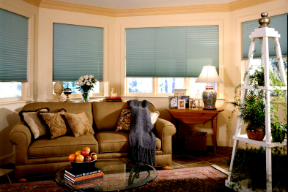 Custom window blinds and shades can help. Contact Houston Blinds For Less to add a personal touch to your new window coverings.